When it comes to eye makeup, even the slightest mark, the faintest line, or deliberate dot can take a look from so-so to sensational. Use the right beauty tools and your makeup will look like it was applied by a pro. Welcome to the newest member of your tool kit; the three prong pen, which is similar to a felt tipped pen, but with three points, and is being used by two innovative beauty leaders, Clarins and Laura Geller Beauty. Clarins offers the 3 Dot Liner to make eyeliner so easy! Simply dot in between the lashes and it’ll define your eyes and make your lashes look thicker, even without mascara. The liquid eyeliner that’s as easy as a pen to use, can also be used to draw a thicker line and offers a mistake proof experience for those of you who have a difficult time creating a bolder eyeliner look. The dots makes eyeliner “buildable” and with less error, even fashioning a flirtatious feline flick or cat eye that so many of us get so wrong. Mark the shape and thickness you want and then connect the dots. Easy as 1-2-3. Laura Geller’s Tri Tip Brow Sculpting Marker, uses the three point technology to help you create gorgeous natural looking brows. The three points gives the illusion of fine hairs, and is fantastic for filling in where hair is sparse or missing. Need a little eyebrow lift? 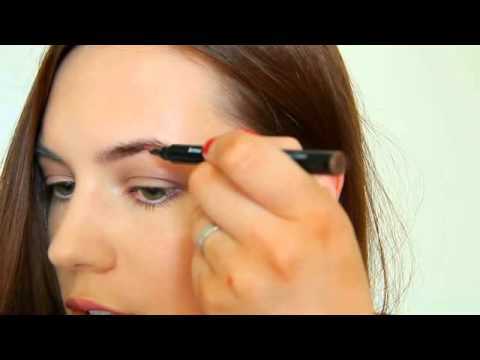 The Tri Tip Brow Sculpting Marker is also excellent for faking that perfect arch as well. It’s available in five shades, from taupe to charcoal, so there’s one that’s just right for you.